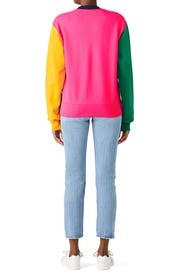 Vibrant color blocking brings playful retro appeal to this eye-catching Cedric Charlier sweatshirt. 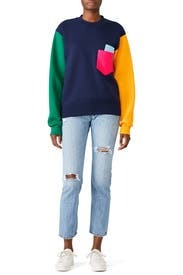 Color blocked knit (50% Cotton, 50% Polyester). Sweatshirt. Long sleeves. Crew neckline. Front pockets. 26" from shoulder to hemline. Imported. Loved this, so comfortable and funky. But it's huge. I could easily go down a size or two and still have the baggy look it's going for. Getting it again but smaller this time. I've never gotten so many compliments on a sweatshirt. & it was super soft and comfortable! It was a touch large but definitely meant to be styled that way. So many compliments on this. Loved wearing it! I couldn't tell you how many compliments I got on this sweatshirt! 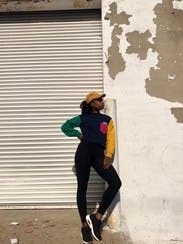 It was beyond comfy, and I styled it 5 different ways! It was true to size and has fun pockets, but it's a little loud and can't be worn often. Easy comfy sweatshirt to mix things up! I wore this around town on a trip to Austin, received so many compliments. 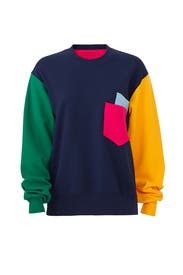 A classic Hanes sweatshirt that gives a retro vibe with all of the different colors. Well made stitching with the different layers, very soft inside still, and perfectly oversized to be cozy - but not sloppy. Would rent again! Looks exactly as it seems. Very chic cool color block. Would wear again. Super comfy and hipster. 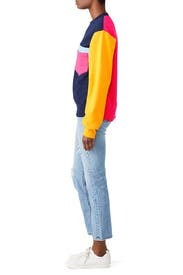 Very cute colorblock. Liked how soft it was and the fit. Was not baggy and was stylish with jeans. My students said I looked "fly"
Great fit. I ordered a small as I typically go for mediums however I wanted to try it. Wore it to work with high waist jeans as it is semi cropped with a thick waist band. Then wore it again to the gym over the weekend with high waist leggings. So cute. No complaints. Generous fit! I could have sized down. 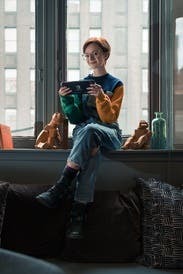 It's a really nice unique sweater, it's very warm. A little snug as far as sweaters go but i wouldn't say it runs small, i think it's meant to be a little tight. Very comfortable. 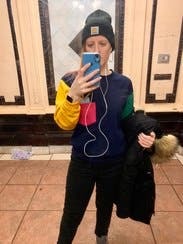 Received many of compliments for the retro 90s look. Fit well. Very cute with a pair of jeans. Comfy, cute, easy to wear with funky tennis shoes.